Duh. Of course it would. But you don’t HAVE cookies. That’s where this recipe comes in. It’s simple, quick, uses only one bowl and, most importantly, delivers what I believe to be the perfect chocolate chip cookie. Crisp and brown on the edges. Soft and chewy on the center. Loaded with buttery, chocolatey goodness (and a sprinkling of peanut butter chips for fun.) I’ve been tweaking it for years based on my grandma’s recipe. She is my baking Madonna and my concept of what’s delicious is conceived from the things I tasted in her kitchen growing up. This incantation is my absolute go-to. Learn it and love it. Feel free to throw things in–nuts, semi-sweet chocolate, coconut–get crazy! This is your moment. The peanut butter chips aren’t a necessity, but for me, peanut butter makes everything better. Should you decide to procreate, you can tell your kids it’s an old family recipe. I won’t tell. Preheat oven to 350 degrees. Grease baking sheets with non-stick baking spray. Using large, microwave-safe bowl soften the butter in the microwave, watching it closely. You want it to be super soft, but not totally melted or bubbling. Stir the sugars into the warmed butter. Smash the lumps out with the back of the spoon. Go on. Use those texting muscles! When the mixture is combined evenly, stir in the next four ingredients until blended and smooth. Then, add the flour until just combined. 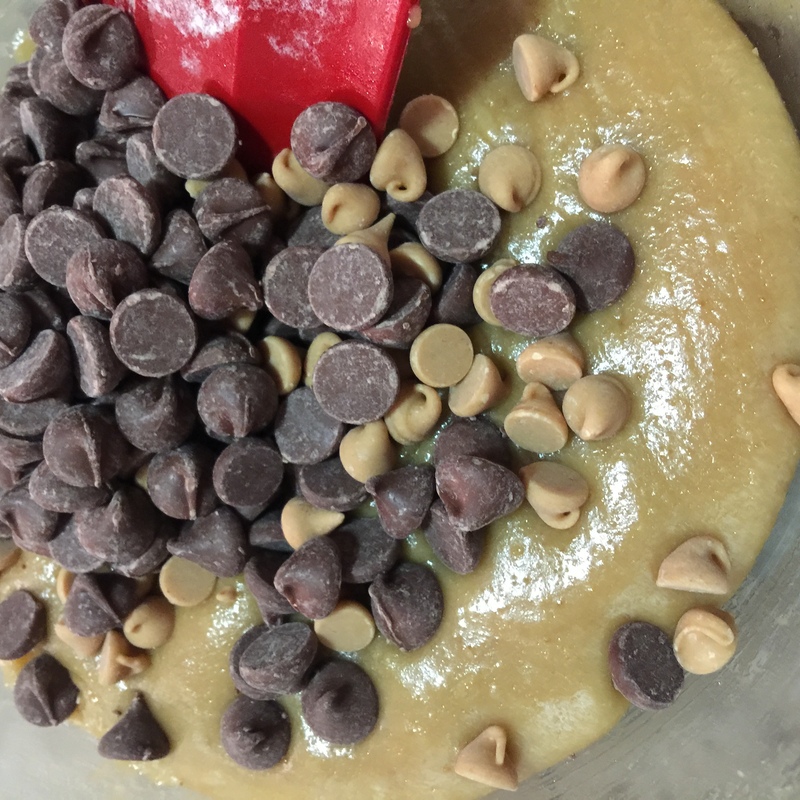 Finally, gently fold in the chocolate chips (and peanut butter chips, if you’re using them) until evenly distributed. Your dough should look something like the image at top left. Form dough into 2-inch balls a couple of inches apart on the baking pans and pop in the pre-heated oven. When the edges are a nice, tan color–usually about 10-13 minutes–they’re done! The center should still be pretty soft, so let them settle for a couple of minutes before removing from the pan. Taste the joy. And tell Frank Underwood I send my regards. 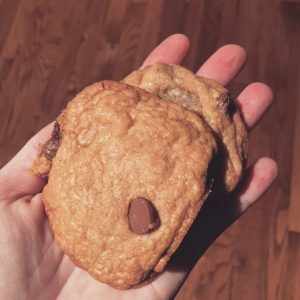 It always makes me sad when I see absolutely delicious cookie recipes like this one because I would have to perform all sorts of sorcery to make these cookies work at high altitude.